I am the host of the Animal Writes show on Pet Life Radio. On my show, I interview best selling animal-related authors, award winning writers and journalists that focus on stories about animals and bloggers with interesting topics to share about animals. The podcasts of each show are available at no charge from Pet Life Radio's web site, through RSS feed, mobile casting, iTunes, iHeart Radio, Spotify, and 30 other podcast distributors. My previous guests include Dr. Marty Becker, DVM, Victoria Stilwell, Rita Mae Brown, Sonya Fitzpatrick, Wendy Diamond, Arden Moore, Wayne Pacelle, Maria Goodavage, Allen & Linda Anderson, Cherie Miller, Cindi Maciolek, Celia Sue Hecht, W. Bruce Cameron, Darlene Arden, Sue Chipperton, Janet Elder, Glenn Plaskin, Sarah Cavallaro, Jennifer Holland, Joe Panz & Big Ant from Rescue Ink, Martin Kihn, Allie Larkin, Alison Pace, Larry Levin, Linda Francis Lee, Dr. Nick Trout, DVM, Sophy Burnham, Nancy Stanley, John Woestendiek, John Zeaman, and more. To link to Animal Writes on Pet Life Radio, click the RSS icon. I appeared as a guest on Charly Kayle's Mind Body Paws show on Empower Radio. I appeared as a guest on Jon Patch's Talkin' Pets show on the GAB Radio Network. YouTube video interview - I appeared as a guest on Val Heart's show to discuss finding lost animals through the use of animals communication. SiriusXM Radio Channel 106 - I appeared as a guest on Sonya Fitzpatrick's show, Animal Intuition. Blog Talk Radio - I was a guest on Sandy Ruminski's Messages from Your Angels show from 11:00 AM - 11:30 AM ET. To listen to the show, please click here. KMOX 1120 AM (St. Louis, MO) - I was a guest on the Overnight America show guest-hosted by John St. Augustine. For more information about the show, please click here. 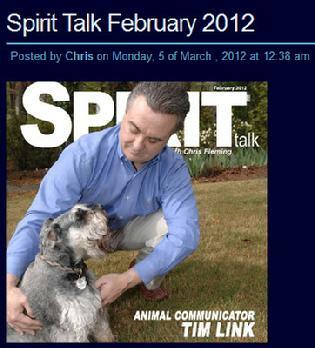 I was a guest on Chris Fleming's Spirit Talk show. For more information about the show and to listen to my interview, please click here and go to the February 2012 posting on the web site. I was a guest on Tenacity Radio's Got Paranormal show. For more information about the show and to listen to my interview, please click here and go to the November 30, 2011 date in the Archives section of the web site. I was a guest on Val Heart's The REAL Dr. Doolittle show. For more information about the show and to listen to my interview, please click here. I was a guest on Kim Iverson's Your Time with Kim Iverson show from 10:00pm -10:45pm Eastern. For more information about the show, please click here. WLBE 790 AM (Leesburg, FL) I hosted the Critter Corner show on All Paws Pet Talk Radio. Colleen Gordon was my co-host. The show aired from 1:00PM - 2:00PM Eastern. Blog Talk Radio - Sandy Ruminski's Messages from Your Angels show. To listen to the archived show, please click here. Internet Radio - (Leesburg, FL) - Mary McBryde's Heartbeat Sunshine show from 10:00AM - 10:30AM Eastern. To listen to the live show, please click here and select the Live Stream button on the upper left side of the screen. December 19th Guest - Humor columnist for Cats and Kittens magazine, contributor to several of the Chicken Soup for the Soul books and author of the recently released book, Who Moved My Mouse? : A Self-Help Book for Cats (Who Don't Need Any Help), Dena Harris. WRHB 1410 AM (Leesburg, FL) Mary McBryde's Heartbeat Sunshine show from 10:00AM - 10:30AM Eastern. To listen to the live show, please click here and select the Live Stream button on the upper left side of the screen. WLBE 790 AM (Leesburg, FL) I will be hosting Critter Corner on All Paws Pet Talk Radio. Colleen Gordon will be my co-host. The show will air from 1:00PM - 2:00PM Eastern. To listen to the LIVE show, please click here and select the Listen Live icon in the upper right side of the screen. November 7th Guest - Fido Friendly magazine publisher and radio show host, Susan Sims. November 14th Guest - International Society for the Protection of Wild Mustangs and Burros president, Karen Sussman. November 21st Guests - Multi-book authors, ministers and Angel Animals Network founders, Allen & Linda Anderson. WTAN 1340 AM (Clearwater, FL) I will be hosting Critter Corner on All Paws Pet Talk Radio. My co-host will be Colleen Gordon. Our portion of the two hour show will air from 7:00PM - 7:30PM Eastern and 8:30PM - 9:00PM Eastern. Annie Greer will be hosting the 7:30PM - 8:30PM portion of the show. To listen to the show LIVE click here and then select the Listen Live icon in the center of the screen. The show will be archived on the All Paws Pet Talk Radio web site, iTunes and on the Pet Life Radio web site. WRHB 1410 AM (Leesburg, FL) Barb Simon's Heartbeat Sunshine with Best Life Barb show from 10:00AM - 10:30AM Eastern. To listen to the live show, please click here and select the Live Stream button on the upper left side of the screen. September 24th Guests - Format change beginning with this show - pet experts Sheryl Matthys, Deborah Wolfe, Karen Watts, Susan Sharpe and Mari Justin will be our regular guests going forward. Healthy Life Radio Network: Victoria Moran's show from 12:25PM - 1:00PM Eastern. WTAN 1340 AM (Clearwater, FL) I will be hosting Critter Corner on the All Paws Pet Talk Radio Network. My co-host will be Colleen Gordon. Our portion of the two hour show will air from 7:00PM - 7:30PM Eastern and 8:30PM - 9:00PM Eastern. Annie Greer, Christopher Ameruso and Debra Wilson will be hosting the remaining segments of the show. To listen to the show LIVE click here and then select the Listen Live icon in the center of the screen. The show will be archived on the All Paws Pet Talk Radio Network web site, iTunes and on the Pet Life Radio web site. August 13th Guests - The Orange Dog founder, Jan Folk and author, Karen O'Toole. August 20th Guests - author, Christine Hamer and Animal Spirit Healing & Education Network founder, Carol Schultz. August 27th Guest - pet CPR and pet first aid expert, Megan Hise and author, Horst Hoefinger. WZPL 99.5 FM (Indianapolis, IN) Kim Iverson's Your Time with Kim Iverson show from 9:00PM - 10:00PM Eastern. WLBE 790 AM (Leesburg, FL) I will be hosting Critter Corner on the All Paws Pet Talk Radio Network. Colleen Gordon will be my co-host. The show will air from 1:00PM - 2:00PM Eastern. To listen to the LIVE show, please click here and select the Listen Live icon in the upper right side of the screen. VoiceAmerica Talk Radio Network: Tonja Walker's Straight Talk Live show from 1:18PM - 1:38PM Eastern. WRHB 1410 AM (Leesburg, FL) Barb Simon's Heartbeat Sunshine with Best Life Barb show from 9:30AM - 10:00AM Eastern. To listen to the LIVE show, please click here and select the Live Stream button on the upper left side of the screen. WTAN 1340 AM (Clearwater, FL) I will be hosting Critter Corner on the All Paws Pet Talk Radio Network. My co-host will be Colleen Gordon. The show will air from 7:00PM - 7:30PM Eastern and 8:30PM - 9:00PM Eastern. Annie Greer will be hosting the 7:30PM - 8:30PM Eastern segment. To listen to the LIVE show, click here and then select the Listen Live icon in the center of the screen. The show will also be archived on the All Paws Pet Talk Radio Network web site, iTunes and on the Pet Life Radio web site. July 30th Guests - author and pet expert, Charlotte Reed and award-winning writer and photographer, Janiss Garza. Janiss' cat, Sparkle, has her own cat advice blog and a new book coming out in August. WRHB 1410 AM (Leesburg, FL) Barb Simon's Heartbeat Sunshine with Best Life Barb show from 9:30AM - 10:00AM Eastern. Good News Broadcast (New York, NY) from 12:30PM - 12:55PM Eastern. Blog Talk Radio: Annette Jones' Paranormal Talk show from 10:00PM - 11:00PM Eastern. To listen to the archived show, please click here or select the mp3 below. Blog Talk Radio: Colleen Carr's Natural Horse Network show from 7:00PM - 8:00PM Eastern. Radio Sandy Springs 1620 AM (Atlanta, GA) Susie Aga's Animal Hour show from 2:00PM - 3:00PM Eastern. To listen to the archived show, please click here and scroll to the May 11th show. WTAN 1340 AM (Clearwater, FL) Will Thomas' All Paws Pet Talk Radio show between 7:00PM - 8:00PM Eastern. Listen to the live show from the internet. I will be discussing pet-related topics during my "Hot Spot" segment. 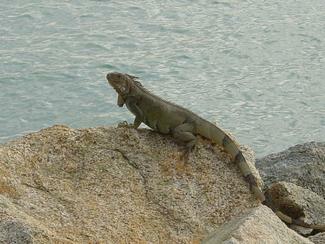 Progressive Radio Network (Vancouver, BC): Deborah Wolfe's Animal Magnet show between 1:00PM - 2:00PM Eastern. Listen to the live show from the internet. Pet Life Radio: Deborah Wolfe's Animal Party show. Podcast to be posted to web site after taping. WTAN 1340 AM (Clearwater, FL) Will Thomas' All Paws Pet Talk Radio show between 7:00PM - 8:00PM Eastern. Listen to the live show from the internet. High Velocity Radio (Atlanta, GA) Todd Schnick and Stone Payton's High Velocity show from 10:00AM - 11:00AM Eastern. To listen to the live show, please click here. March 15, 2010 Todd Schnick and Stone Payton's High Velocity Radio Show. Hear the archived show by clicking here and selecting the PLAY button associated with the full interview. KKNW 1150 AM (Seattle, WA) Dawn Stansfield's The Dawn Stansfield show from 7:00PM - 8:00PM Eastern. KFNS 590 AM (St. Louis, MO) Randy Grim's Animal Tails Radio show from 8:00AM - 9:00AM Eastern. WTAN 1340 AM (Clearwater, FL) Will Thomas' All Paws Pet Talk Radio show from 7:00PM - 8:00PM Eastern. WLBE 790 AM (Leesburg, FL) Colleen Gordon's All Paws Pet Talk Radio show from 1:00PM - 2:00PM Eastern. WLBE 790 AM (Leesburg, FL) Colleen Gordon's All Paws Pet Talk radio show from 1:30PM - 2:00PM Eastern. To hear the archived show, click here and scroll to the Sunday 1/10/10 1:00PM WLBE 790 Broadcast Hour listing. My interview aired during the last 30 minutes of the show. KKNW 1150 AM (Seattle, WA) Dr. Pat Baccili's The Dr. Pat Show from 2:00PM - 2:30PM Eastern. See individual listing below for the link to the archived show. WLBE 750 AM (Leesburg, FL) I will be one of the hosts on the All Paws Pet Talk radio show from 1:00PM - 2:00PM Eastern. The featured guest on the show will be Sonya Fitzpatrick, featured pet psychic on Animal Planet and Sirius Satellite Radio. To listen to the archived show live, click here and scroll to the Sunday 01/24/10 1:00PM WLBE 790 Broadcast Hour listing. Blog Talk Radio: Pair a Normal Guys show from 10:00PM - 11:00PM Eastern. To hear the archived show, please click here. Contact Talk Radio: The Dr. Anne Marie Evers show from 3:00PM - 4:00PM Eastern. To hear the archived show, please click here. January 14, 2010 Dr. Pat Bacilli's The Dr. Pat Show on KKNW 1150 AM. Hear the archived show by clicking here and selecting the PLAY button associated with the 01/14/10 show. January 10, 2010 Colleen Gordon's All Paws Pet Talk radio show on WLBE 790 AM. Hear the archived show by clicking here and scrolling to the Sunday, 1/10/10 1:00PM show (second half hour of the show). Blog Talk Radio: Annette Jones' Paranormal Talk show from 10:00PM - 11:00PM Eastern. To hear the archived show, please click here or select the mp3 below. KZSB 1290 AM (Santa Barbara, CA) Richard Dugan's Tell Me Your Story show from 6:00PM - 7:00PM Eastern. To listen to the archived show, please click here and scroll to the November 14, 2009 show. Radio Sandy Springs 1620 AM (Atlanta, GA) Susie Aga's Animal Hour show from 2:00PM - 3:00PM Eastern. To listen to the archived show, please click here and scroll to the November 24, 2009 show or click on the mp3 below. November 24, 2009 Susie Aga's Animal Hour show on Radio Sandy Springs. Hear the archived show by clicking on the link below. WZAB 880 AM (Miami, FL) Kandee G's Nothing But Good News show from 3:00PM - 4:00PM Eastern. To listen to the archived show, click here. 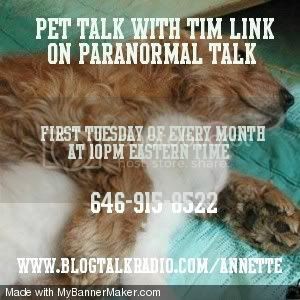 Pet Life Radio: Brandy Stark's Paranormal Pets show (air date September 21, 2009). To hear the archived version of the show, click here, scroll to the Paranormal Pets show and then scroll to episode 22. Or, you can listen to the archived mp3 below. Pet Life Radio: Raquel Wynn's Wynn with Dogs show (air date September 14, 2009). To hear the archived version of the show, click here, scroll to the Wynn with Dogs show and then scroll to episode 19. Or, you can listen to the archived mp3 below. Radio Sandy Springs 1620 AM (Sandy Springs, GA) Gail Cohn's Book Talk with Gail show from 1:00PM - 2:00PM Eastern. To hear the archived version of the show, please click on the mp3 below. KKNW 1150 AM (Seattle, WA) Dr. Pat Baccili's The Dr. Pat Show from 1:30PM - 2:00PM Eastern. To hear the archived show, click here. September 21, 2009 Brandy Stark's Paranormal Pets show on Pet Life Radio. Hear the archived show by clicking on the link below. September 17, 2009 Dr. Pat Baccilli's The Dr. Pat Show on KKNW 1150 AM (Seattle, WA). Hear the archived show by clicking here. September 14, 2009 Rachel Wynn's Wynn with Dogs show on Pet Life Radio. Hear the archived show by clicking on the link below. September 14, 2009 Gail Cohn's Book Talk with Gail show on Radio Sandy Springs. Hear the archived show by clicking on the link below. By For and About Women Radio The Mother Daughter Club show with Kathe Gogolewski. To hear the archived show, click here or open the mp3 below. KKNW 1150 AM (Seattle, WA) Dr. Pat Baccili's The Dr. Pat Show from 2:00PM - 2:30PM Eastern. To hear the archived show, click here. August 19, 2009 Dr. Pat Baccilli's The Dr. Pat Show on KKNW 1150 AM (Seattle, WA). Hear the archived show by clicking here. August 10, 2009 Kathe Gogolewski's Mother Daughter Club show on By For and About Women Radio. Hear the archived show by clicking on the link below. Pet Life Radio: Arden Moore's Oh Behave! show podcast. The recording of the archived show is listed below (on this web site page) or click here to go to Pet Life Radio's web site, click on the Oh Behave! pet podcast, scroll half-way down the page and click on Episode 76. Lifestyle Talk Radio Network: Jon Patch's Talkin' Pets show from 5:00PM - 6:00PM Eastern. The archived show is listed below (on this web site page). PsychJourney Podcast with host Deborah Harper from 1:00PM - 1:40PM Eastern. The archived show is listed below (on this web site). KKNW 1150 AM (Seattle, WA) Dr. Pat Baccili's The Dr. Pat Show from 1:00PM -2:00PM Eastern. To listen to the archived show, click here. Contact Talk Radio: Tara Sutphen's Transformations with Tara show from 11:57PM - 1:00PM Eastern. To listen to the archived show, click here. July 21, 2009 Arden Moore's Oh Behave! show on Pet Life Radio. Hear the archived show by clicking on the link below. July 15, 2009 Dr. Pat Baccilli's The Dr. Pat Show on KKNW 1150 AM (Seattle, WA). Hear the archived show by clicking here. July 14, 2009 Deborah Harper's PsychJourney show. Hear the archived show by clicking here or by clicking on the link below. July 11, 2009 Jon Patch's Talkin' Pets show on Lifestyle Talk Radio. Hear the archived show by clicking on the link below. BBS Radio Station 1 Dr. Pat Baccili's The Dr. Pat Show from 9:00PM - 10:00PM Eastern. To hear the archived show, click here. WLTW 106.7 FM (New York, NY) (Clear Channel) Christine Nagy's Get Connected show. The recording of the archived show is listed below (on this web site page) or click here to go to WLTW's web site and scroll to the June 7, 2009 Get Connected show archive. Theatre of the Mind Radio: Kelly Howell's show from 5:00PM - 5:45PM Eastern. To hear the archived show, please click here. June 7, 2009 Christine Nagy's Get Connected show on WLTW 106.7 (Clear Channel) Hear the archived show by clicking on the link below. June 3, 2009 Dr. Pat Baccilli's The Dr. Pat Show on KKNW 1150 AM (Seattle, WA). Hear the archived show by clicking here. Talk Shoe Radio Network Dr. Tonya K. Freeman's Tonya & Friends show. To hear the archived show, please click here. Independent Expression Radio Shirley MacLaine's show from 9:00PM - 10:00PM Eastern. The recording of the archived show is listed below (on this web site page). Hear the archived show by clicking on the links below (separated into two parts due to length). Hear the archived show at www.blogtalkradio.com/WB-Ward or click on the link below. Hear the archived shows at www.blogtalkradio.com/Annette or click on any of the links below. Hear the archived shows at www.blogtalkradio.com/NHN or click on any of the links below. Hear the archived show at http://www.radiosandysprings.com/showpages/animalhour.htm or click on the link below. Hear the archived show at www.blogtalkradio.com/stations/sedonatalkradio/louise-aveni or click on the link below. Hear the archived show at http://www.contacttalkradio.com/hosts/annemarieevers.htm or click on the link below. Hear the archived show at www.inner-speak.com/radio_show.php or click on the link below. You can hear the archived show by selecting the recording below. To find out more information about this show, please click here. Hear the archived show at www.radiosandysprings.com/brightspot.php or click on the link below. Hear the archived show at www.blogtalkradio.com/dynamictransformations or click on the link below. Hear the archived show at www.sedonatalkradio.com or click on the link below. Hear the archived show at www.christineagro.com. Hear the archived show at www.contacttalkradio.com/hosts/alisonkelly.htm. Hear the archived show at www.blogtalkradio.com/lifelaughterhappiness.